RMD Jewellery: Happy New Year - Yes I know it's March!! Happy New Year - Yes I know it's March!! Yes I know its March already, hard to believe but having spent all of December and January travelling around the stunning countryside of Tasmania I am already behind the 8 ball in getting organised this year. But I have managed to finally get some pictures and some new designs in the last 4 weeks. Some of these designs I have been creating for months but never seem to get time to photograph them to list them online. My favourite little addition to RMDJewellery is the Rosebud Necklace, I wear one of these almost daily as it’s so simple, delicate and light I forget I am wearing it. To start 2011 off with a bang I am giving away one of these lovely new additions to my store. Add a link to this post or any items from www.etsy.com/shop/rmdjewellery to your blog or any website – 3 entries per post, limit to one entry per site. so difficult to pick a fave, Rach. they are gorgeous i love em!!! I really love the Set of 3 Textured Stacking Bangles. They look beautiful! My favourite is the Oxidized Sterling Silver 11mm Pearl Cup Domed Ring, it's like a gorgeous statement ring, so pretty! 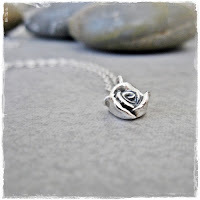 I love the Tiny Fine Roesbuds on Sterling Silver Posts teamed up with the Rosebud Necklace even more stunning. Embossed Fine Silver Antique Disc Earrings on Handmade Earwires by RMDJewellery - simply delightful, I wish I was a woman and could wear them but alas I am not a woman. Tiny Fine Silver Rosebud Studs on Sterling Silver Posts is my favourite!